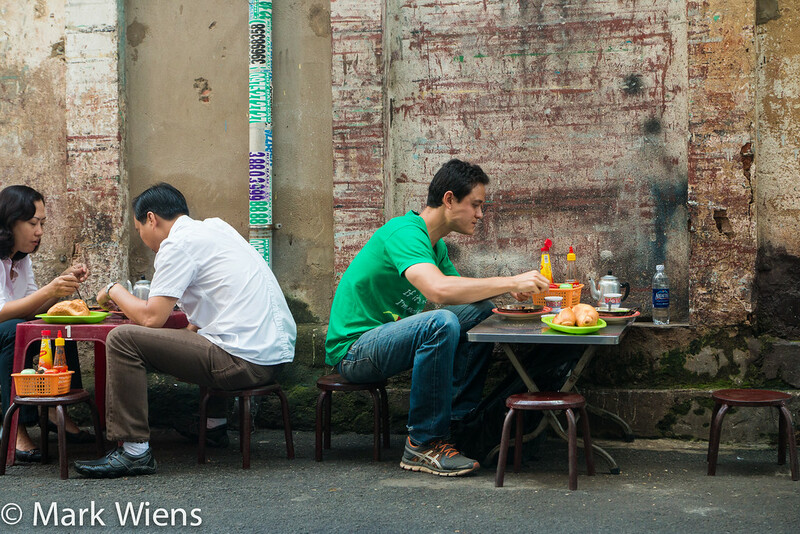 Are you ready to start eating insanely delicious Vietnamese food when you’re in Saigon? So I decided to reach out to you, by posting a video on my YouTube channel, asking what and where I should eat during my trip to Saigon, Vietnam. I was overwhelmed with the response, and received many local suggestions for everything from restaurants to street food stalls to eat at within the city, and also many favorite dishes to try. 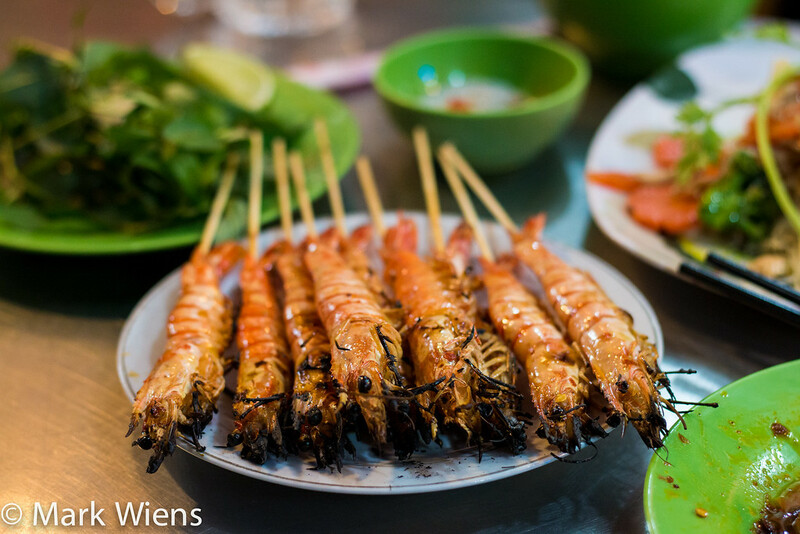 When I landed in Saigon, I had my notes compiled with info on what to eat and where, and I was eager to spend as little time in my hotel as possible, and as much time on the streets eating and enjoying Saigon. Thank you all for your incredible Vietnamese food suggestions. It turned out to be one of the most memorable food trips I’ve had in a long time, and my wife and I took photos and videos of almost everything that went into our stomachs. 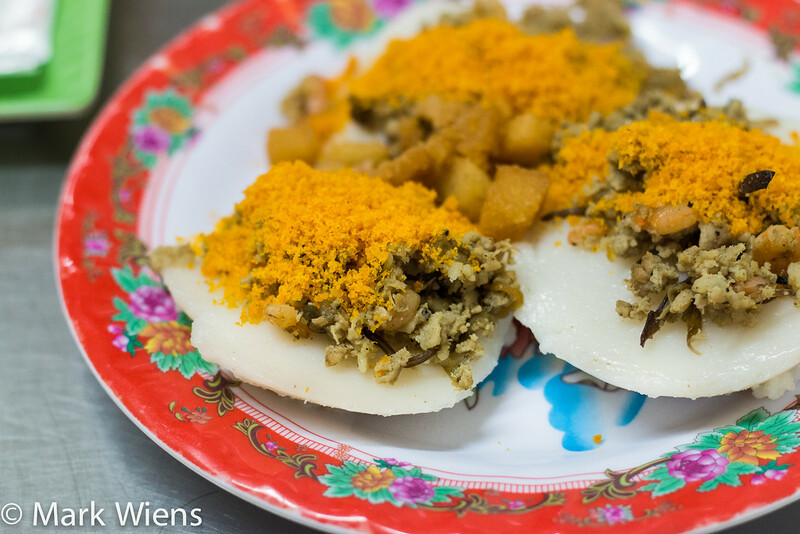 With this easy guide, I hope you’ll be able to taste, enjoy, and have some incredible food experiences when you’re in Saigon, Vietnam too. 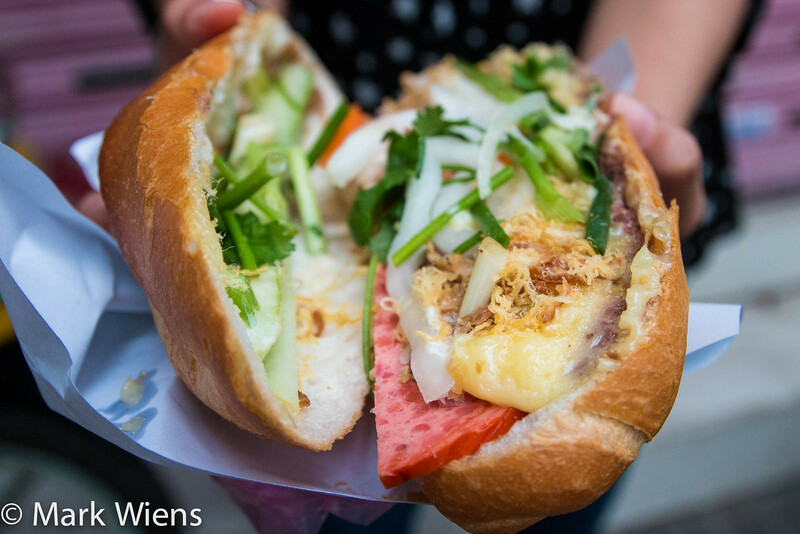 The following guide, featuring 25 Vietnamese dishes to eat in Saigon, is a result of your kind tips and recommendations, kilometers of walking around and sweating, and a month of eating food that I’ll never forget! I ordered just the standard bánh mì, a fresh and crusty baguette filled with slices of pork, luncheon meat, pate, mayonnaise, some nicely flavorful chillies, and a handful of freshly sliced cucumbers, and fragrant cilantro. What I especially loved about their version, was that it was heavy on the herbs and fresh veggies. The family running the business were all very nice and helpful, and they were excited that I was eating there. 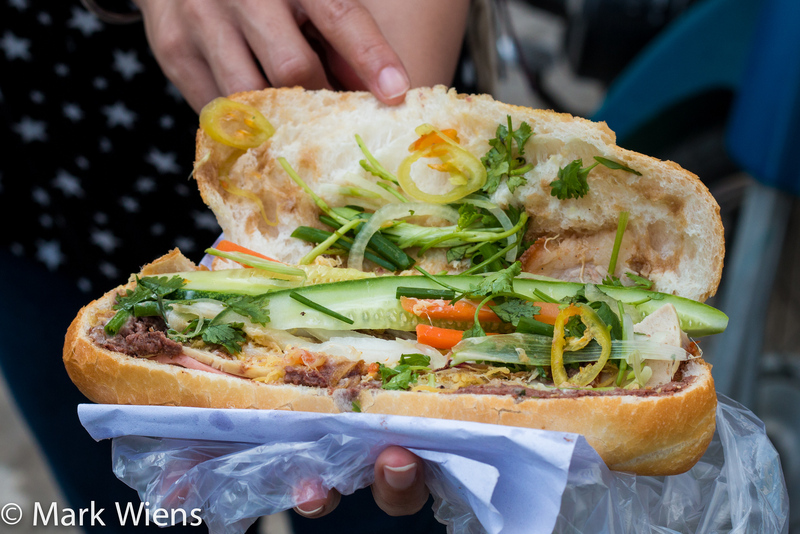 It turned out to be one of my favorite banh mi sandwiches of my time in Saigon. STREET FOOD ENVIRONMENT CAN HARDY GET BETTER THAN THIS! No matter if you’ve been to Vietnam before or not, you’ve likely heard of pho, if not already eaten it many times before. The noodle soup didn’t become so famous for nothing – it really is one of the most common dishes in throughout the country, and it makes the Vietnamese food menu at nearly every sit-down restaurant too. Pho is the combination of soft rice noodles in a soup broth, normally prepared with either bo (beef) or ga (chicken) – both of which can be extremely delicious, but I’m normally more of a beef kind of guy. The noodles are flash boiled until soft, topped with your choice of meat, and often finished with a sprinkle of chopped green onions and sometimes sweet onions as well. But what I really love most about eating pho in Vietnam is the fresh plate of herbs, typically including sawtooth herb, mint, and Vietnamese coriander, along with house-made chili sauce, that’s on your table for self-service when you eat it. While I did enjoy a bowl of pho from time to time when I was in Vietnam, I think pho is sort of the pad thai of Vietnamese cuisine, in that, yes it’s very good, however there are also so many other delicious dishes to try – perhaps it has a little undeserved fame, when compared to so many other delicious Vietnamese dishes? After visiting the cathedral of Notre Dame and walking around the park for a while, I continued walking along the street, and all of a sudden I felt myself getting extremely hungry. I looked up, and there was a pleasant looking restaurant called Pho So 1 Ha Noi. It was a nice open air eatery, with clean metal tables, and stashed piles of herbs and condiments. I ordered pho bo (beef pho ) and Ying had the pho ga (chicken pho), both of which were simple, and flavorful. I especially loved the all-you-can-eat herbs, pickled garlic, and chilies. The owner, was quite a friendly man as well. Pho So 1 Ha Noi is a great simple restaurant to eat pho at if you happen to be in the area. After eating here and looking this place up, I found Jodi also loves this place. 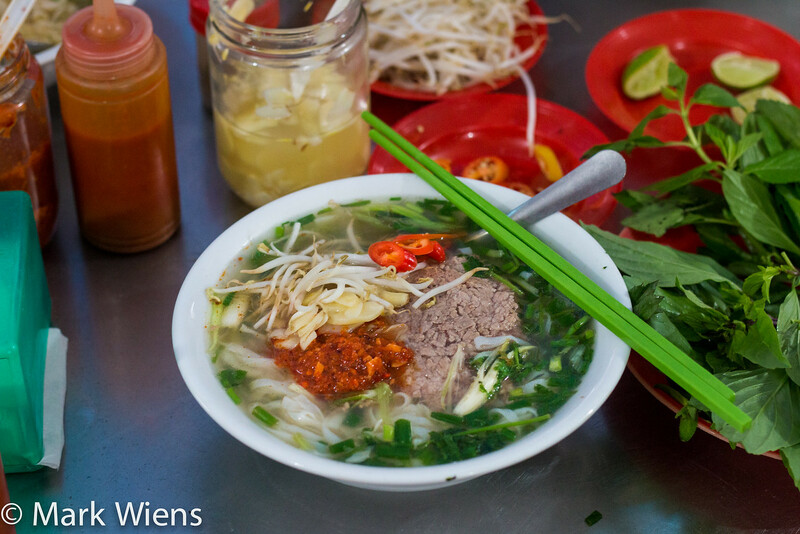 There are countless restaurants in Ho Chi Minh City to devour a bowl of pho, from the tiniest of street food stalls, to indoor air conditioned restaurants. I think probably the best versions of pho (and possibly the best versions of many dishes throughout southeast Asia), come from the restaurants that are somewhere in-between – the open air, family run establishments – sometimes in shophouses, sometimes in the front of homes, and sometimes at the bottom of apartment buildings. I was browsing through Vietnam Coracle, when I found Phở Phượng 25, and I was in the area one day, so decided to try it. I ordered the pho tai, the rare beef version of pho. The broth was a little on the sweet side for me, but it was nicely balanced, just slightly oily, but rich and flavorful, with a subtle hint of spice. The beef, after dipping it in the roasted chili sauce, was delicious. 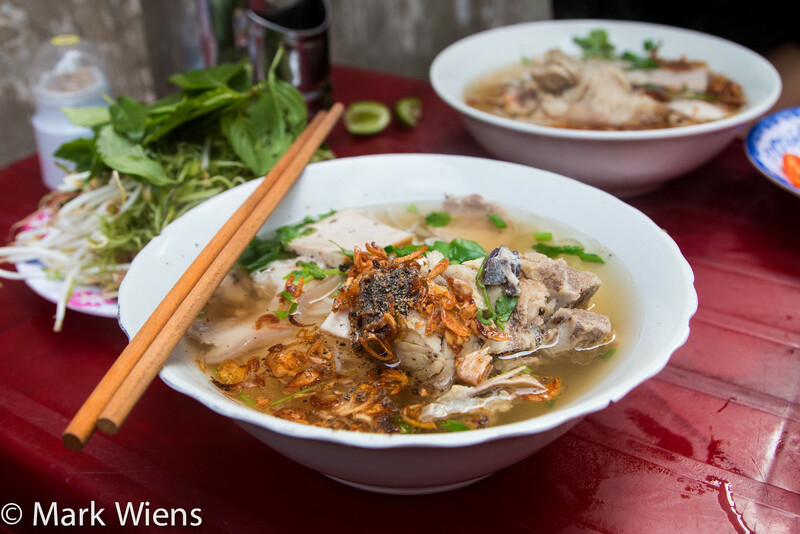 Vietnam is a land of noodle soups, and many enjoy at least one bowl of noodles a day, some, maybe even a few. 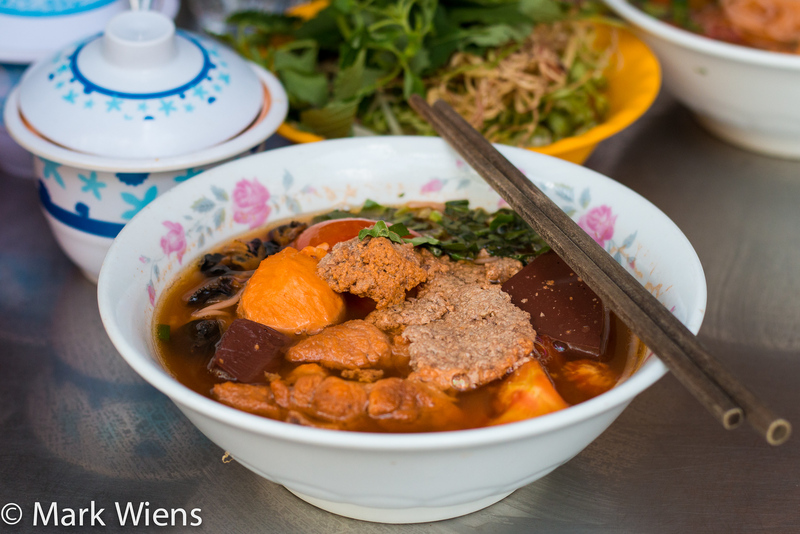 After trying many different types of Vietnamese noodle soups during my stay in Saigon, I “think – and I say that because I change my food mind quite often” I can say my favorite is bun rieu. 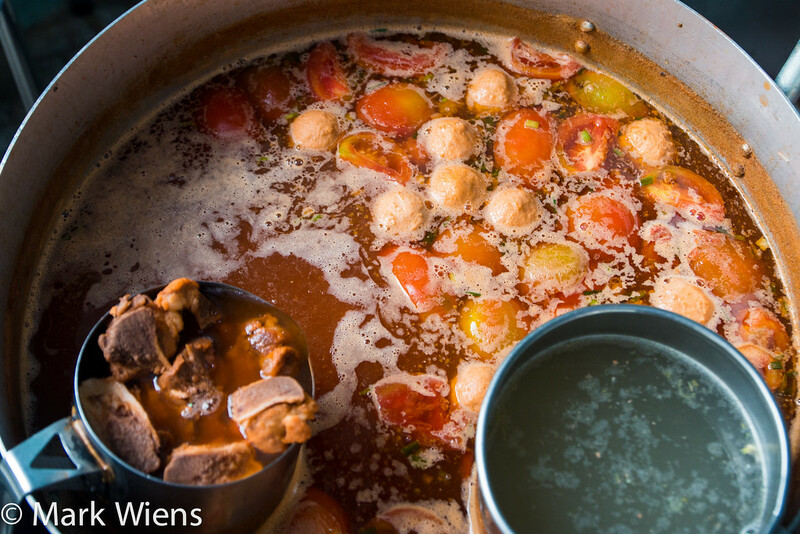 The broth is made from a crab base stock, and another key ingredient are tomatoes, which create a broth that’s slightly seafood tasting, yet has a beautiful natural sweet and tartness from the tomatoes. I think there’s also often some rice vinegar included in the recipe to give it a lovely sour and well-rounded flavor. Along with the wonderfully flavorful broth in a bowl of bun rieu, the noodles are often similar in shape and size to spaghetti noodles, except soft rice noodles. The dish reminded me of a few similar Thai dishes like northern Thai nam ngiao, a tomato stew. To eat bun rieu, you normally garnish it with shrimp paste or crab paste, then load it up with chili sauce, a squeeze (or I like multiple squeezes) of lime juice, and then devour it with a small mountain of herbs and shredded vegetables. 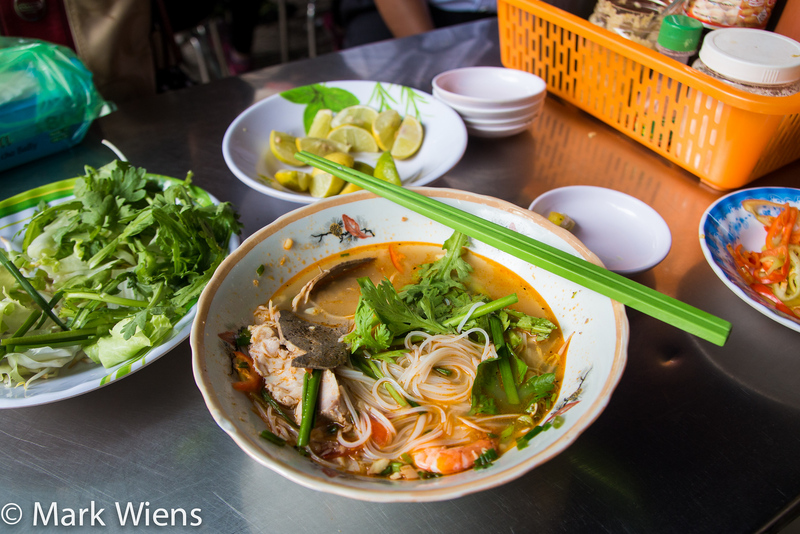 For noodle soup in Vietnam, I really think it can’t get much better than a steaming hot bowl of bun rieu cua. Another recommendation from the YouTube video, was a restaurant called Bún riêu Nguyễn Cảnh Chân. It proved to be an insanely delicious restaurant, that not only served an excellent bowl of bun rieu cua, but the staff were all friendly, and I like that the restaurant was located on a pleasant wide side road in Saigon, shaded by nice big trees. My bowl of bun rieu cua at Bún riêu Nguyễn Cảnh Chân was perfectly balanced, with a gorgeous crab flavor, a hint of bitterness, and a light sweetness from the always simmering tomatoes. The meat and other ingredients in the soup were generously added, and the condiments were pungent and flavorful. This was indeed one of my most memorable bowls of noodles during my trip to Vietnam. Graham Holliday, an author and expert on Vietnamese food labels bun mam, despite its pungent smell, as his wholly favorite Vietnamese noodle dish. 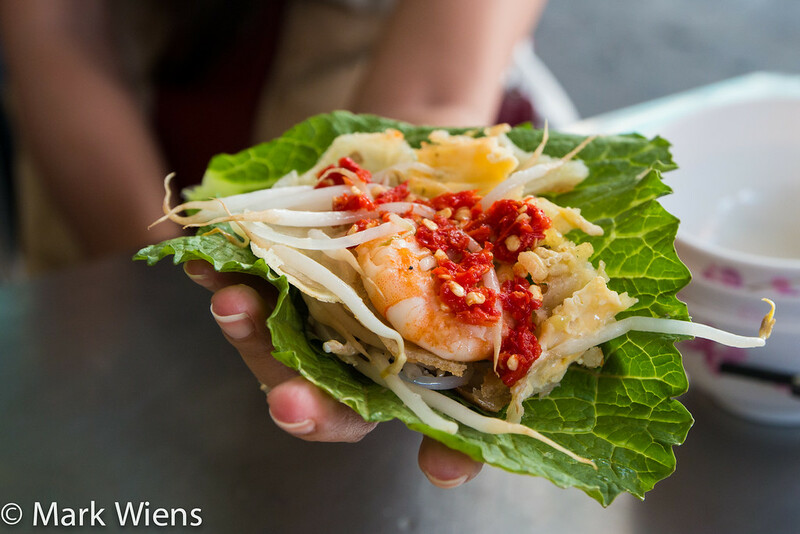 Bun mam is specifically a southern Vietnamese dish, and just like most other noodle soups, you’ll find it at both sit down restaurants and portable street food stalls around town – though it’s not nearly as common to spot as some other noodle dishes on this blog. Although bun mam was honestly a little too sweet of a flavor for me (I’d go with a bowl of bun rieu most of the time), it is widely popular, and it’s a Vietnamese food you definitely need to try when you’re in the city. Recommended by both from Mark from Sticky Rice Hanoi (one of the top Vietnamese food blogs especially covering Hanoi) and Jodi from Legal Nomads, Bún Mắm Phan Bội Châu is a longstanding restaurant, located right across the street from Benh Thanh Market, that serves hot fresh bowls of bun mam. Their broth was dark and beautiful, and along with the noodles, the mixture of goodies, like shrimp, a slice of pork belly, and a few bites of tangly squid were wonderful. Probably my favorite bite out of my entire bowl of bun mam, was not even the meat, but it was the eggplant, which was extremely succulent and juicy. Despite enjoying my bowl of bun mam, I thought their broth was overall much too sweet for my personal preference. I’m not sure if it’s always like this, or if this particular restaurant serves their bun mam on the sweet side? Nevertheless, Bún Mắm Phan Bội Châu is in a great location, so if you happen to be shopping at Benh Than Market, you can easily stop by to sample it. 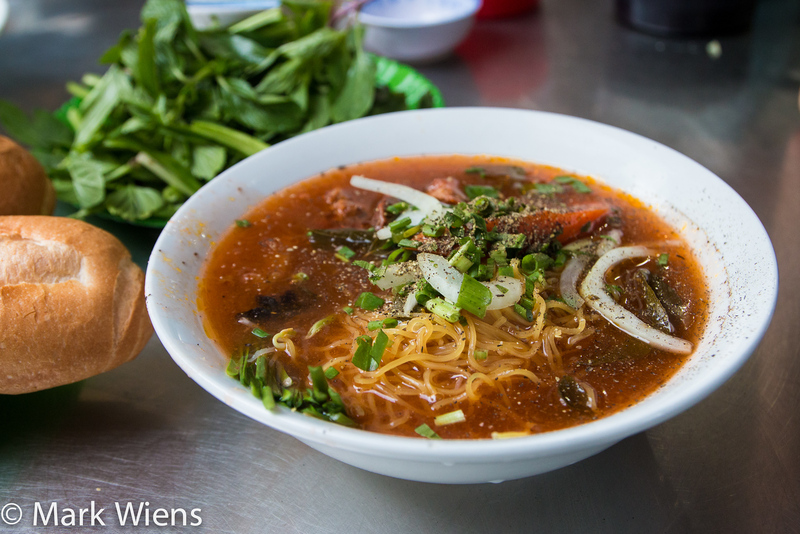 Probably one of the dishes most mentioned that many of you suggested I should eat in Vietnam was bun bo Hue (I think there’s an entire Vietnamese culture surrounding this dish, and it may be gaining some traction against pho)! 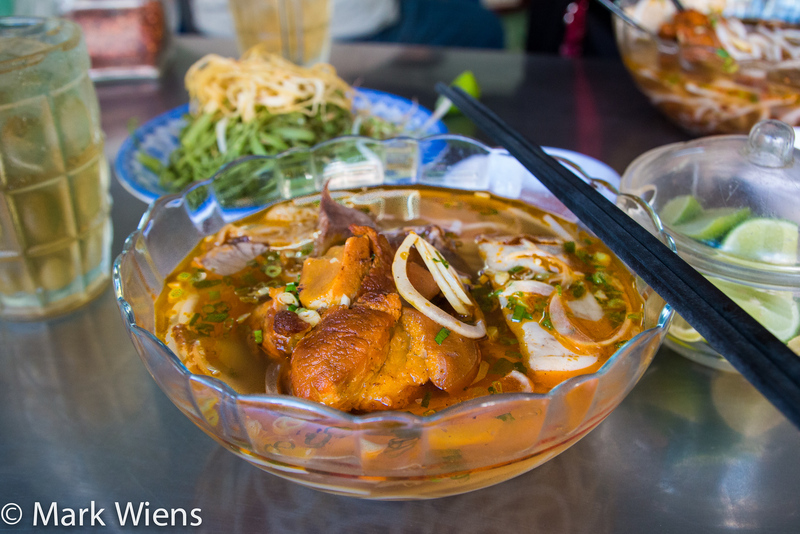 Alright, bun bo Hue is not actually from Saigon, it originates in Hue – a city on the coast of central Vietnam, which unfortunately I haven’t been able to visit yet – but I included it on this Vietnamese street food guide because it’s one of the most beloved noodle soups in Saigon as well. 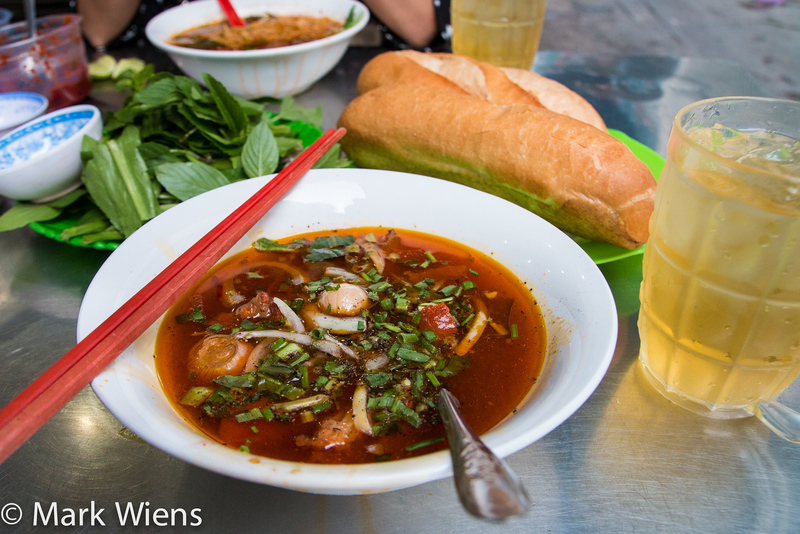 Bun bo Hue is beef based, and in Vietnam it’s known for being spicy and flavorful. The noodles are normally rice vermicelli noodles, of the sphagetti size, and a bowl of bun bo Hue is often served with slices of beef, a hunk of either ox tail or pork knuckle, cha lua (Vietnamese sausage and ham), and a handful of green and sweet onions. Again just like every other noodle dish, the extra herbs, flash boiled vegetables, and chilies, give bun bo Hue an added dimension of deliciousness. i am a food blog calls bun bo Hue, a dish “you never knew you loved,” and that was true for myself, having never had it before going to Vietnam, but I loved it (by the way, check out her amazing recipe for the dish). For myself, after bun rieu, bun bo Hue is probably my next favorite Vietnamese soup, and I haven’t even been to Hue yet. I’ve eaten noodles for years and years in Asia, and throughout multiple countries, and I have to say, Bún bò Chú Há was the first bowl I’ve ever had served in a clear see-through bowl. It was pretty cool, like eating out of a fish aquarium where I could see what was swimming in my soup. All jokes aside, I thought the bun bo Hue at Bún bò Chú Há restaurant was wonderful. The broth had a superb umami depth to it, was salty and just slightly sweet, with a citrus touch. The slices of beef were lightly chewy, as they should be, but the real highlight was the hunk of ox tail (I think? ), which was tender and juicy, and just slid off the bone. Along with serving a delicious bowl of bun bo Hue (and those awesome transparent glass bowls), the duo of ladies who served me (whom I assume are the owners of the family run restaurant) were extremely kind. After she dished out my hot bowl of soup, I took about 50 pictures from all angles, and after photographing my bowl, I then sat down to make a video and eat it. But just as I was about to start seasoning my bowl, the owner ran up to me, and said something and grabbed my bowl. Next she proceeded to dump out all the broth (which was cold by then), and filled it up with brand new hot steaming broth. She handed it back to me with a smile. Now that’s Vietnamese hospitality. 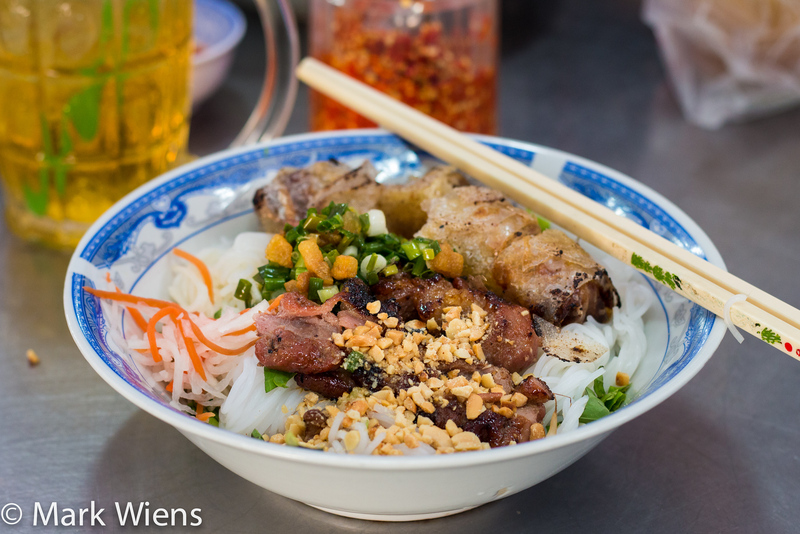 On one of my final days in Saigon, I was walking around a local neighborhood market and decided to try yet another Vietnamese noodle soup dish – this time, a dish called bun moc. The noodles, bun, are the thin soft rice vermicelli noodles, which are so easy to eat and go down so easily as well. The broth in bun moc is normally pork based, a simple and soothing soup, that’s not spicy at all, but just comforting. It’s the type of noodle soup you might want to eat relaxing rainy day. 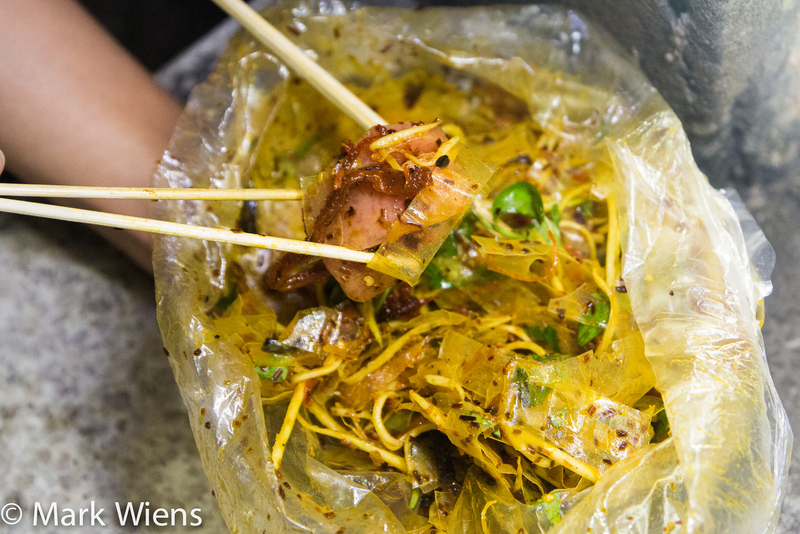 Along with the rice vermicelli noodles and pork broth, a bowl of bun moc also typically includes some chunks of pork meat, maybe even a bone, meatballs, and Vietnamese sausage. 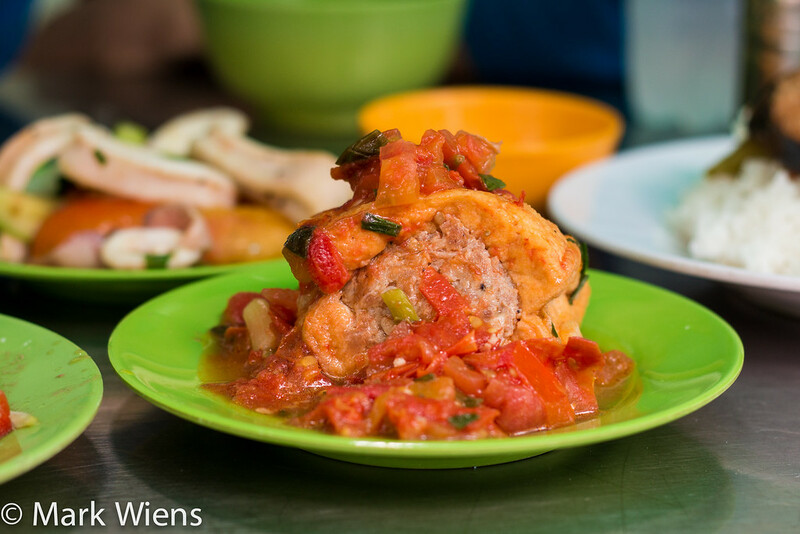 Although bun moc is said to have originated in the north of Vietnam, it’s extremely popular throughout Saigon as well. Since I had so many other Vietnamese foods to try, I actually only managed to eat bun muc once, at a small tiny little street food stall in the middle of an alley near Chợ Bàn Cờ market (I put the little food stall on the map, but this place is not worth going out of your way just to eat, because you’ll find the same thing all over the city). The lady serving the bun moc was extremely friendly and generous, and I ordered up just her normal bowl of bun moc. The noodles were slippery and silky, and my bowl included a nice hunk of pork, some slices of Vietnamese sausage, and what really made it for me, a handful of crispy deep fried shallots thrown on top. I seasoned my bowl of bun moc with lime juice, plenty of black pepper, herbs, and crushed chilies, and it was a wonderful Vietnamese street food breakfast. 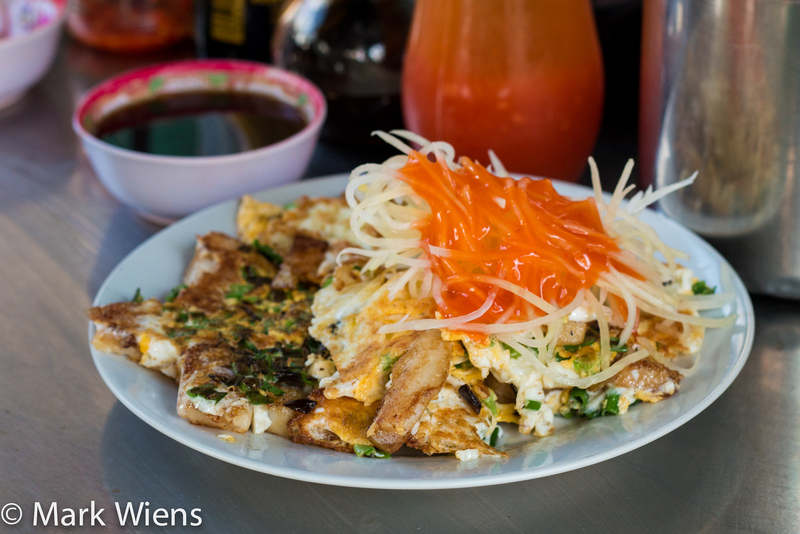 Yet another dish, that has a huge following of Vietnamese cuisine lovers, is Hu tieu Nam Vang. Nam Vang, as I understand, is the Vietnamese word for Phnom Penh in Cambodia, and Hủ Tieu has connections to Teochew in China. So what does that have to do with this Vietnamese favorite food? 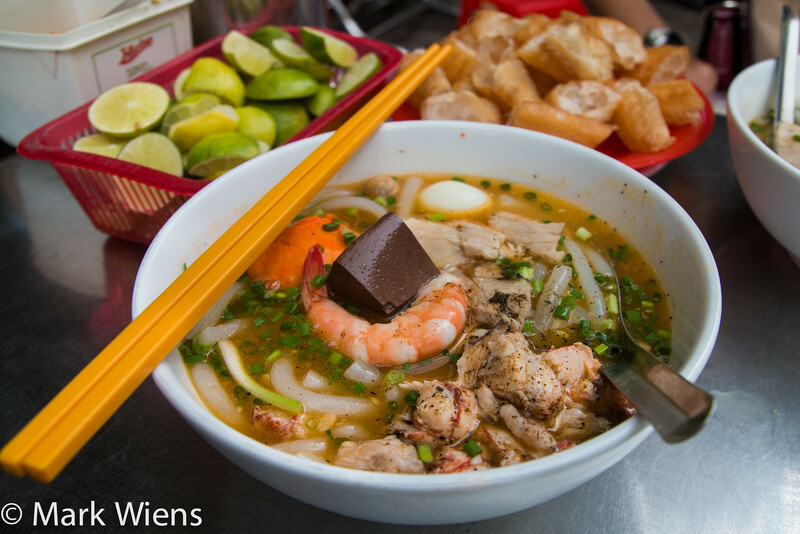 As I’ve read, Hủ Tieu Nam Vang is a Cambodian and Chinese pork based noodle soup, that contains slices of all sorts of organs, and a shrimp or few, plus an assortment of other additions. Hủ Tieu Nam Vang was a little on the plain side for my personal taste buds, but I did like it when spiced up with some chili paste, loaded with chilies, and combined with that huge fresh plate of herbs and vegetables that it’s always served with. I often saw local Vietnamese season their Hủ Tieu Nam Vang with the transparent looking chili sauce and dark soy sauce as well. Just a few minutes walk from where I was staying at Le Blanc Hotel in Saigonwas Cao Thang road (where there are a number of wonderful restaurants including the outstanding op la restaurant #2 on this food guide), I was walking around when I noticed a crowd huddled around a noodle stall on the street. 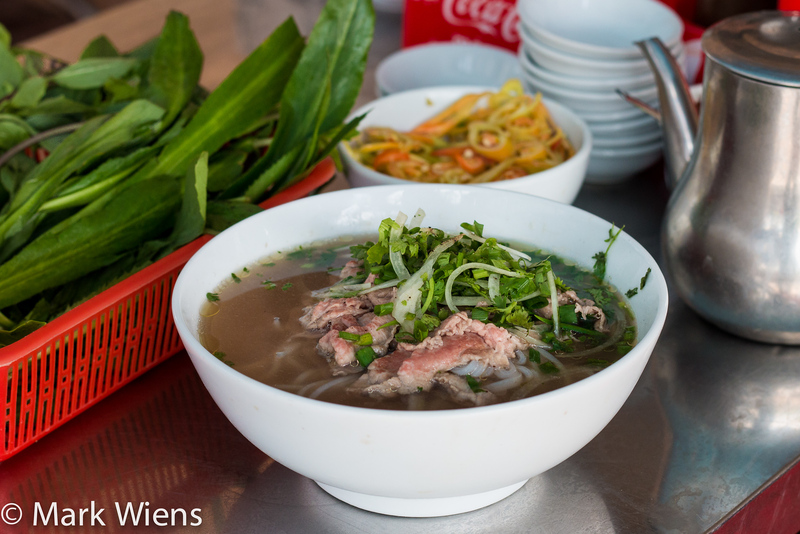 Dangling from a tree branch was a sign that said “Hủ Tiếu Nam Vang – 22,000” – and the price and the atmosphere made it nearly impossible for me not to sit down for a bowl. Since it was quite a budget price for a bowl of noodles especially in central Saigon District 1, it wasn’t all that heavy on the meat, yet it was a nice mixture of noodles, pig parts, a shrimp, and a nice basket of herbs and vegetables to garnish. It was simple, but just normal, and quite tasty, plus the street food atmosphere here was perfect. Another bowl of Hủ tiếu, this time a different style, was at another restaurant not far from where I stayed, at a famous place called Hủ tiếu Nam Vang Nhân Quán. The bowl of noodles at this restaurant was more expensive than at the street food stall above, but it included at least twice the amount of meat, and it indeed was better quality. This time around, I ordered yellow egg noodles and instead of the soup inside, I got the soup on the side. I have to admit, this was a marvelous bowl of noodles, stacked with toppings and flavor. Just like bun bo Hue, another dish on this list that’s not from Saigon, but this time rather from Hanoi, is bun cha. 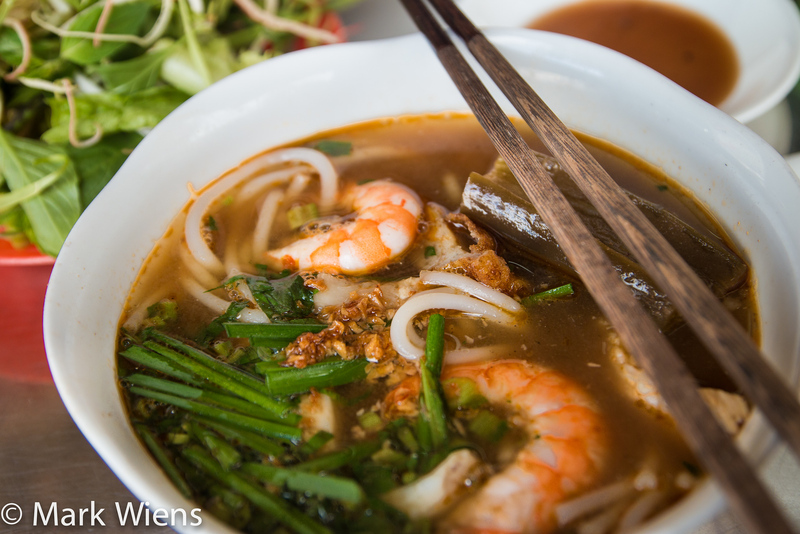 The reason I included it on this Saigon food article is because I simply love it – if there’s ever a restaurant with a country wide Vietnamese food menu, I would probably jump at bun cha. When I visited Hanoi, years ago back in 2010 or so, I had bun cha at one of the most well known spots, and it blew my mind with how good it was. For years I dreamed about another bowl of bun cha, until finally I returned to Vietnam this time-round, and I needed to satisfy my craving. Bun cha is a dish that uses bun, fresh rice vermicelli noodles, the same noodles used in bun thit nuong, which are soft and easy to chew. 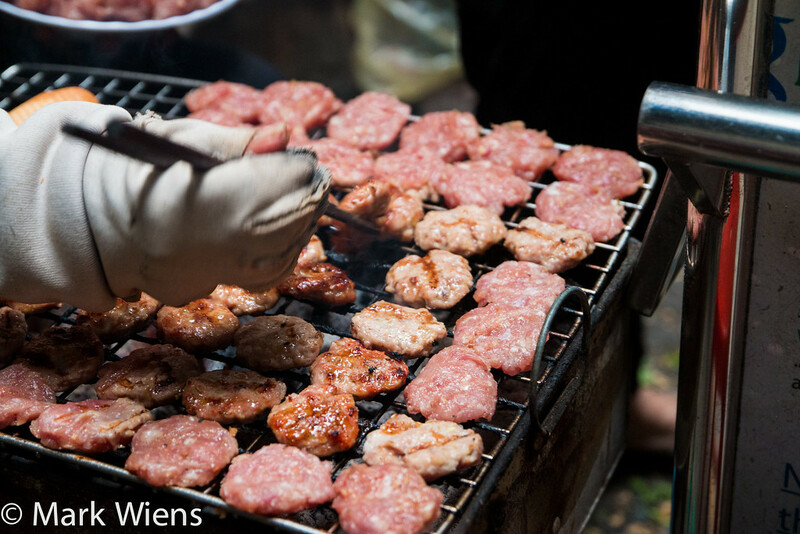 The next component of bun cha, are little seasoned pork patties (kind of like pork sliders), that are grilled over charcoal. The main way I saw most Vietnamese eating bun cha, was to add a bit of rice vermicelli to the pork patty soup, garnish with garlic, chilies, and herbs, and then repeat. 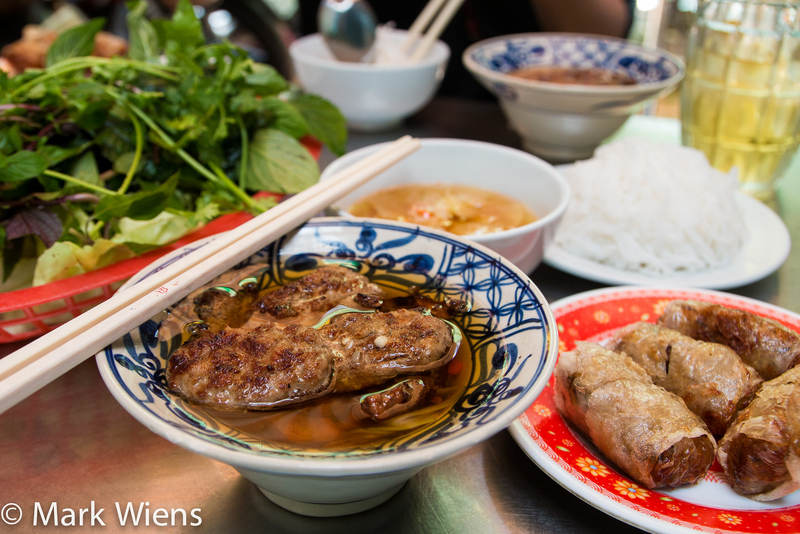 Bun cha is an absolute sensational dish, and if you don’t visit Hanoi, even though that’s definitely where the best is, you can still try it in Saigon. From some research on many Vietnamese food blogs and websites, on one of my final days in Saigon, I finally decided to try and get a flavor for the dish I had missed for so long since my previous trip to Hanoi. I settled on a place called Bún Chả Ánh Hồng, because it wasn’t too far, and I had tried to visit a few places closer to Benh Thanh Market that seemed to be closed. Anyway, when I arrived to Ánh Hồng, I could smell the aroma of pork smoke pouring from the entrance. From the front it looked just like a tiny restaurant, but walk into the alley, and inside the restaurant opens up into a large courtyard with plenty of tables and staff. The grilled pork was wonderful, extremely smoky, and the soup was salty and a little sweet. The bun and herbs were delicious. Overall, it wasn’t as good as I remember in Hanoi, but it was still pretty tasty and definitely worth eating. Banh canh, according to Wikipedia, actually means soup cake in Vietnamese, that’s the literal translation. That’s likely because the noodles are so hearty and so thick. 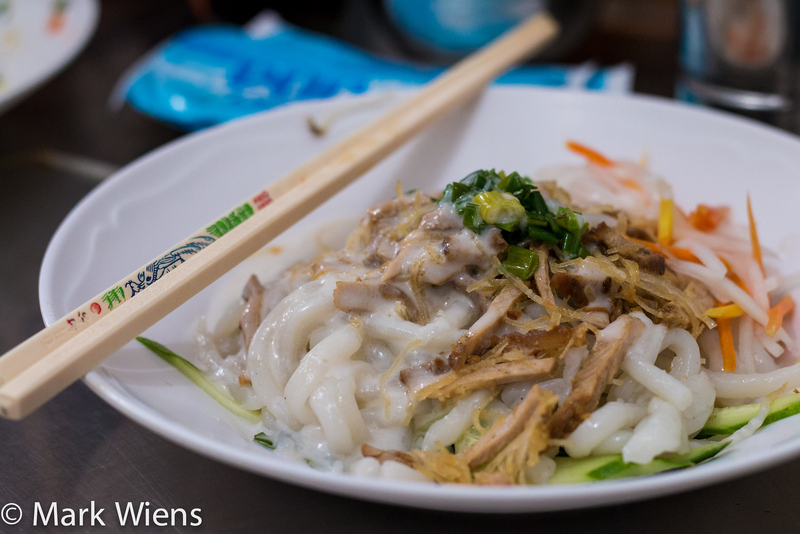 Banh canh is quite similar to Japanese udon noodles, except I thought the noodles, which are typically made with a combination of rice and tapioca starch, were more sticky and a little chewier than udon, which are typically made with wheat flour. Although there are a few different versions of banh canh, the one I ate, and fully enjoyed was banh canh cua, the thick starchy noodles with crab. Instead of being a typical noodle soup with a thin stock, banh canh cua is more like a hearty stew, the broth is thickened like gravy, almost like Thai cuisine style radna. The gravy normally has quite a mellow crab flavor, but what’s really impressive are the nuggets of crab meat that come in a bowl, and the toppings, including chilies and limes. If you’re a crab lover like I am, this is a Vietnamese dish for you. A few of you said that this was your favorite version of banh canh cua in all of Saigon, so I knew it was a place I needed to try. Trần Khắc Chân only opens in the afternoon, and I thought I was going to beat the crowds by arriving at a random time, about 3 pm in the middle of the afternoon. But I arrived to find nearly the entire restaurant was already packed out. I ordered just the normal bowl of banh canh cua, which was pretty good sized, and came brimming to the top of the bowl with gravy, swirls of noodles, and an impressive collection of crab and meatballs. A hit of lime juice and chilies made things even better, and I absolutely loved it. On top of a marvelous bowl of banh canh cua, all the staff and the owner of the restaurant were all very kind and smiled when we said we were from Thailand. 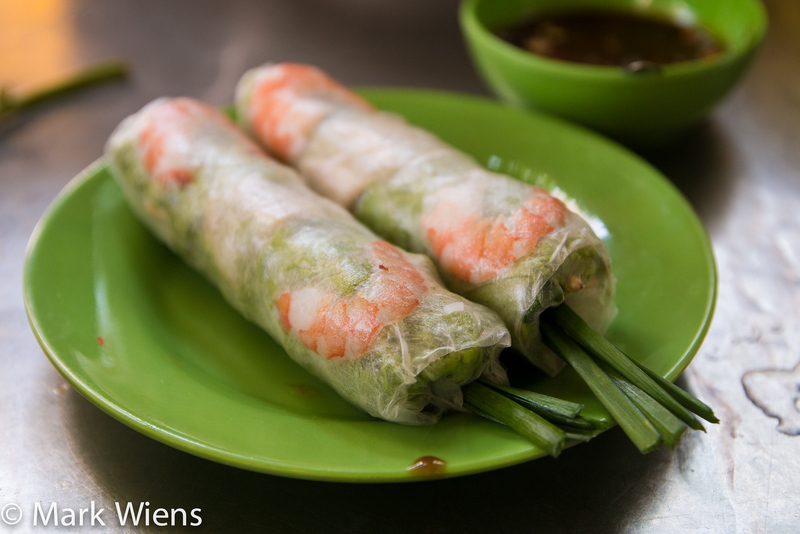 While pho might be the first dish that many people think of when they think about Vietnamese cuisine, for myself, it was and always has been goi cuon, the fresh, non-deep-fried summer rolls (though I often call them fresh spring rolls) that are ubiquitous is Vietnam. I could probably eat goi cuon all day long and with every meal, so I was pretty happy to see them available nearly everywhere I looked in Saigon. From street food stalls to fancy restaurants, you’ll never be far from goi cuon. 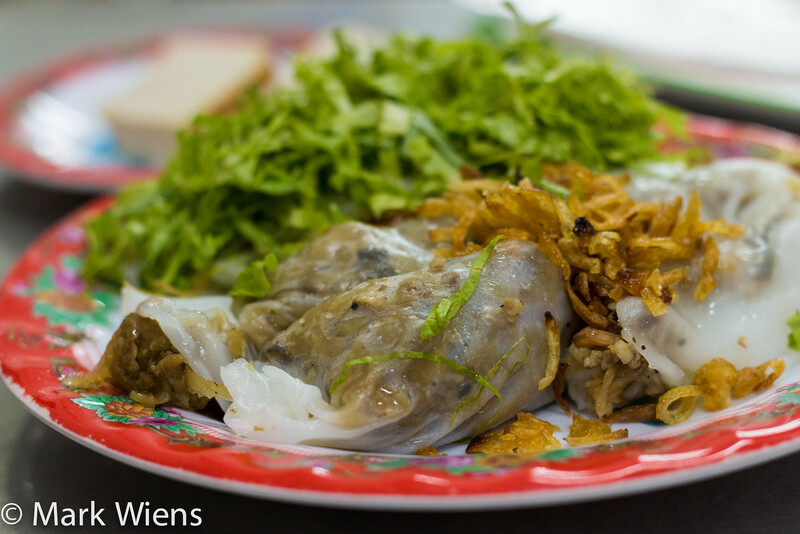 Cha gio, are completely different taste-wise than their goi cuon counterparts, and they share few characteristics other than their egg roll shape and the fact that they’re often sold side by side at many restaurants and street food stalls. Cha gio are Vietnamese deep fried spring rolls, and though I’ve tried spring rolls (or egg rolls) in many places around the world, Vietnam makes some of the best I’ve ever had. 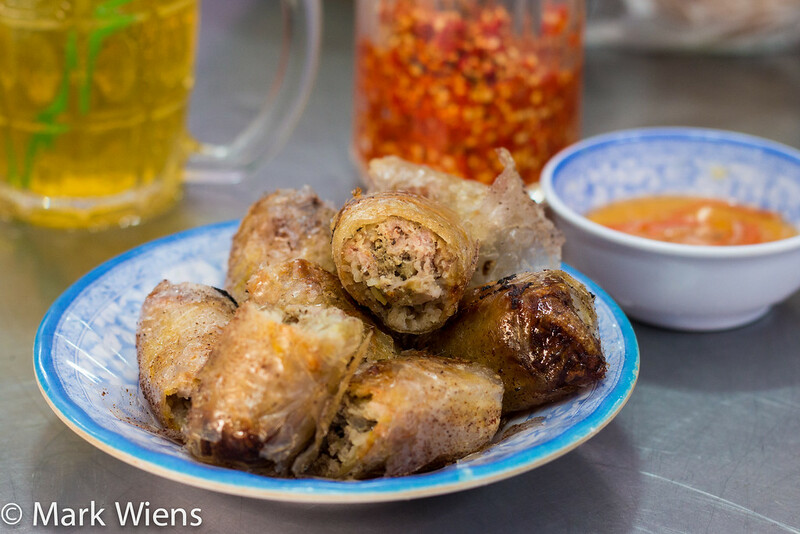 The egg rolls are often a combination of mung bean noodles, minced pork, and sometimes crab if you can find them, mixed with a subtle blend of salty spices, wrapped in rice paper, and then deep fried to a crisp. What I love most about cha gio is the wrapper, which is typically prepared with rice paper, that when deep fried, almost has the crunch and thinness of baklava. For my first taste of banh trang tron, I stopped at Bánh Tráng Trộn Chú Viên and I actually ordered, what seemed to me like the carb-less version of banh trang trong (maybe it was even just mango salad? do you know? ), including all the ingredients without the rice paper. But anyway, though I made a mistake ordering, they for sure have banh trang trong available as well. 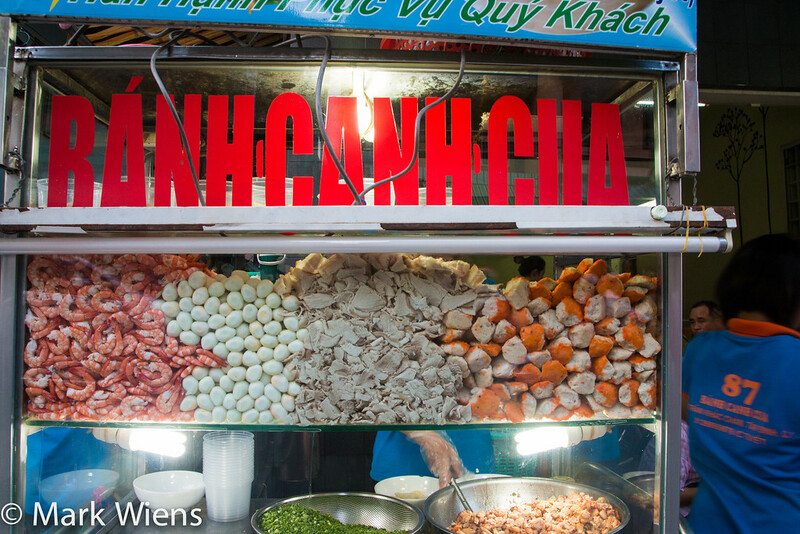 Starting around 3 pm, this famous stall opens up along the busy side of the street, and motorbikes pull up to make their snack orders – it’s sort of like an extremely busy drive-through, everyone hungry for banh trang tron. Another one of the most popular places to eat banh trang tron in Saigon is outside both the Notre Dame Cathedral and Turtle Lake at night. It’s a huge social hangout area for young people, and there’s nothing better to do when socializing than eat some snacks. 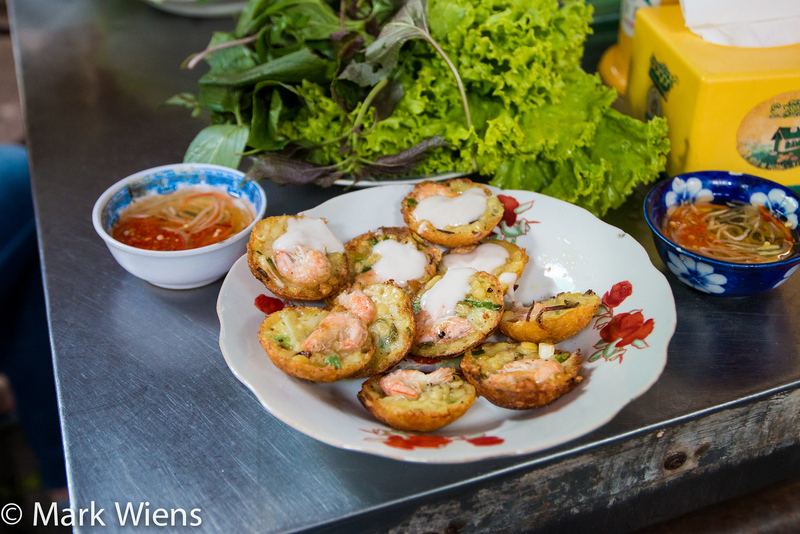 Banh trang tron is served all over the place here, mostly from makeshift street food stands and popup stalls. Sitting around the dark Turtle Lake at night munching on bites of bah trang tron from a plastic bag, was quite enjoyable. 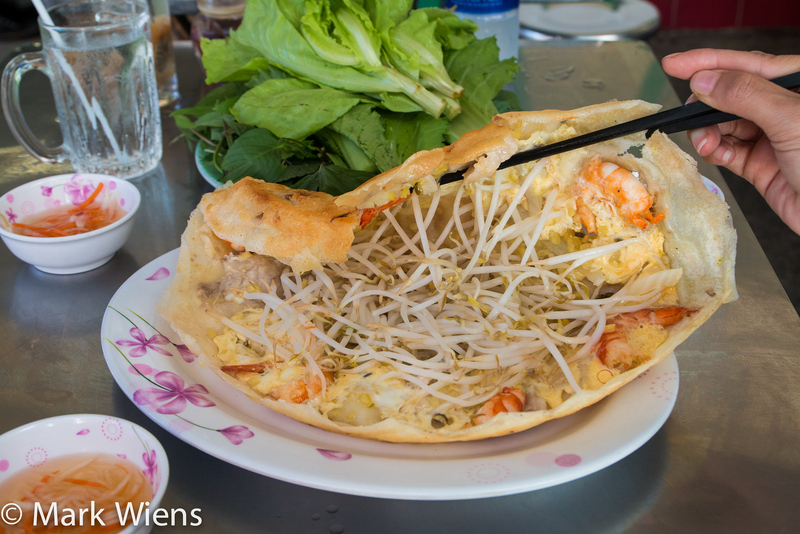 Another similar park snack in Saigon is banh trang nuong, sometimes referred to as a Vietnamese pizza. 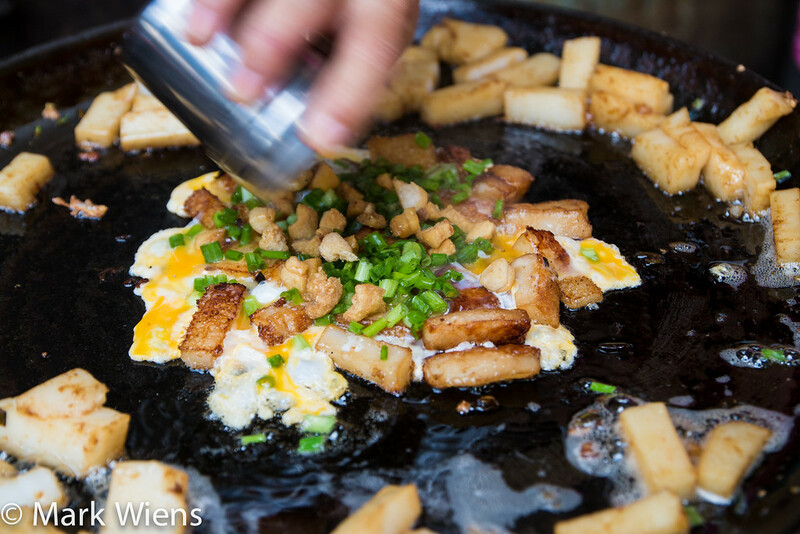 A sheet of rice paper is thrown over a grill, topped with a quail egg, some green onions, and occasional other ingredients, then folded over into a crispy taco. It’s smoky and crunchy, and makes a good Vietnamese leisure snack, and it’s also widely available across these two social hangout spots. 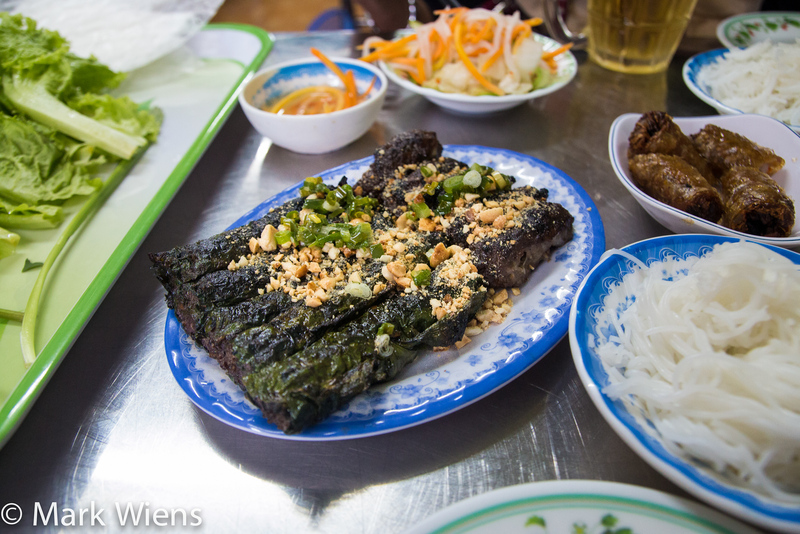 Cơm Tấm Ba Ghiền is likely the most famous place to eat Vietnamese broken rice and grilled pork in all of Saigon. So this was a restaurant I knew I couldn’t miss. I could literally smell the food from the front of the street as I approached the restaurant – a sweet porky smoky aroma that immediately made my taste buds begin to water. When I arrived to Cơm Tấm Ba Ghiền they were grilling up a mind-blowing quantity of pork, literally buckets of marinated meat, and two huge grills were continuously churning out delicious thick cut pork chops for the dozens of hungry customers. I decided to order the full carnivore platter, what I called the grand-slam of Vietnamese food, known as cơm tấm bì chả sườn trứng ốp la, which is literally a little bit of all things meat, plus an egg, all over a small bed of piping hot broken rice. The pork chop was meaty, sweet and salty, and thickly cut. The meat loaf and other assorted meats were also wonderful, combining to create what was easily the best version of com tam suon I had during my stay in Saigon. I have to admit, the food at Cơm Tấm Ba Ghiền was a little on the greasy side, but it was so worth it, and such a hearty plate of delicious protein. Thank you all for the recommendations to eat here. 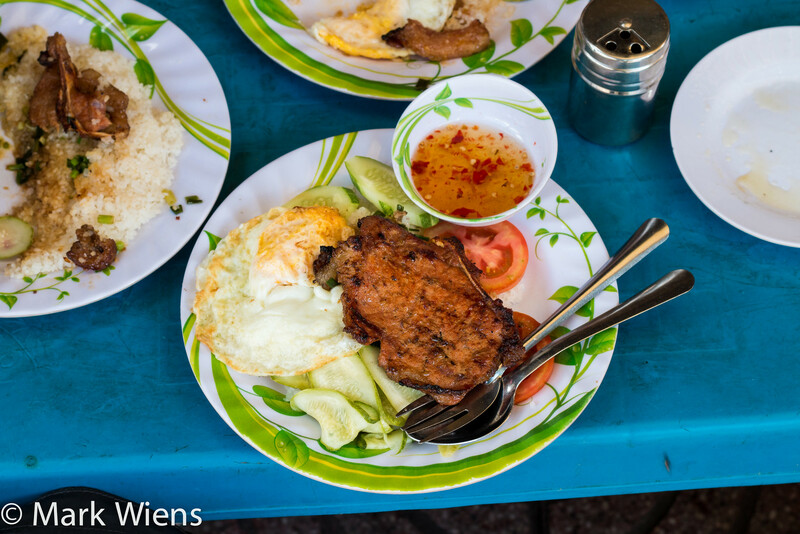 If you catch a whiff of pork grilling on the side of the street, they are most likely serving com tam suon nuong – you’ll find it literally everywhere. Com tam suon is probably the meal I ate most frequently when I was in Saigon, readily available, more filling, in my opinion, than a bowl of noodles, and I’m a huge rice lover. 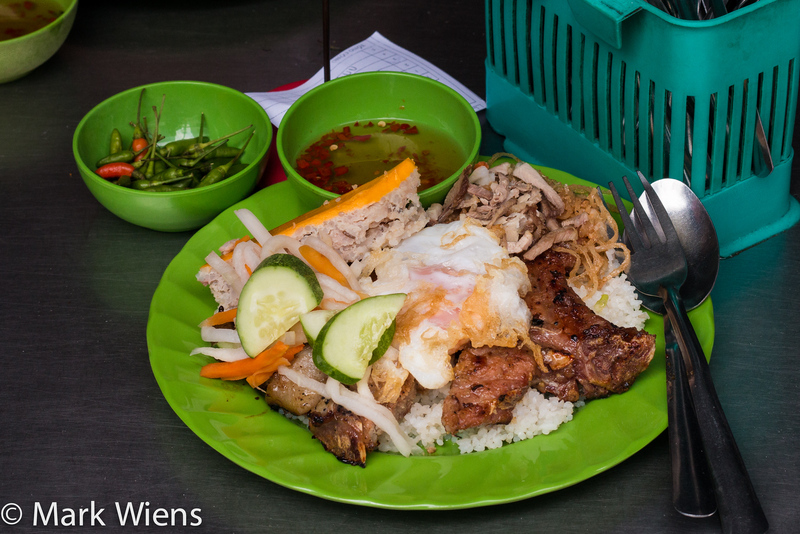 At many street side stalls in Saigon a plate of com tam suon nuong, with just the broken rice and pork chop should run around 30,000 VND and with an egg around 35,000 VD – 40,000 VND. Perhaps as readily available as com tom suon around Saigon, is another one of the most typical rice meals you can eat, com binh dan, which literally translates to commoner’s rice. It’s basically the khao gaeng (rice and curry in Thailand) or nasi campur (rice and curry of Malaysia), style dining experience of Vietnam. Com binh dan is one of the most filling meals you can buy in Saigon on a budget – easily the best stomach filling meal for value. At any com binh dan stall you’ll first see a glass cabinet filled with the day’s supply of pre-cooked dishes, all waiting to be ordered. The food usually ranges from braised pork belly, any number of fish dishes, and one of my favorites, tofu stuffed with minced pork and covered in tomato sauce(if you see it, you’ve got to try it, I’m sill dreaming about it). 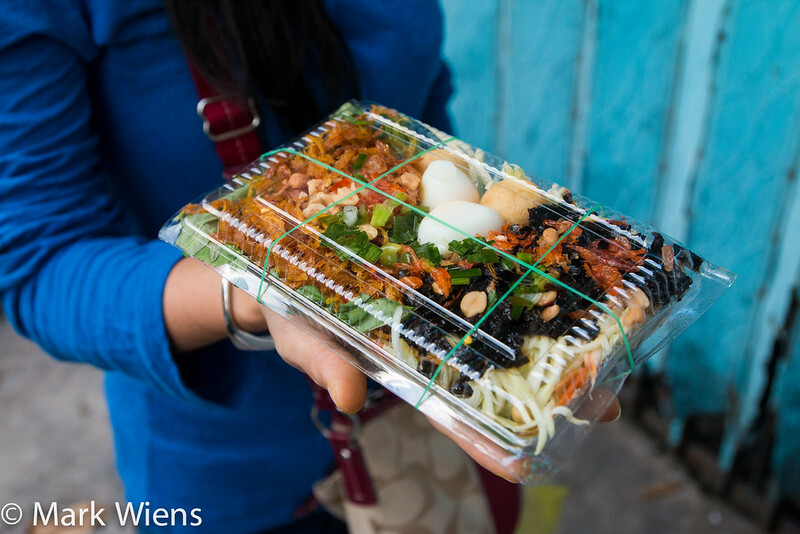 To order your meal at a com binh dan street food stall, you can simply point and choose to whatever dishes look good. Often a plate of rice with 2 or 3 dishes on top will cost 20,000 – 30,000 VND ($0.92 – $1.38), and if you get rice with dishes on the side in separate bowls, it will run a little higher, but you usually get bigger portions. For myself, being a lover of rice accompanied by multiple meat and vegetable sides dishes, com binh dan is one of my favorite Vietnamese meals to eat for lunch in Saigon. Walking around one day, I headed down a side street and was greeted by a delicious looking supply of pre-made dishes filled into a glass cabinet, and since I was quite hungry right then, I stopped for lunch. This restaurant was very typical, so really you’ll find this exact type of food at thousands of stalls throughout Vietnam. The family serving the food were all very nice and the ladies dishing out the meals were smiling and happy that I was so enthusiastically taking photos of their motherly cooking. I had a very satisfying com binh dan lunch here, and I tried everything from fried fish, to pork and beef, and my particular favorite, again, the tofu stuffed with minced pork and topped with tomato sauce. 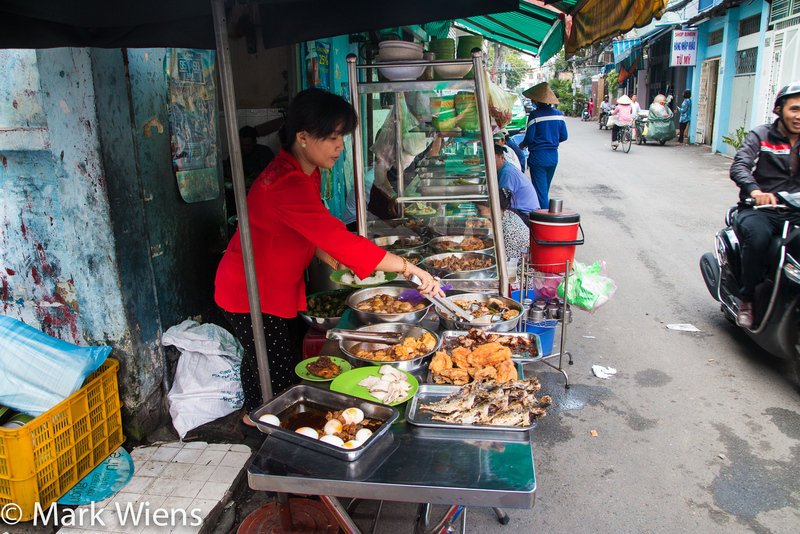 There are a near infinite amount of com binh dan stalls throughout Saigon and you’ll find spots wherever you walk. Make sure the food looks fresh, and then order what you like. Down another alley (that seems to be where many good foods are found), this time somewhere along Hem 39 in between Nguyen Dinh Chieu and Vo Van Tan streets, is where I had my first taste of ca kho to, and I definitely smelled this place before I saw it. The food stall, though not the cleanest of places, had some great character to it, and from the swarm of customers, who were chowing down on massive plates of rice topped with all sorts of different dishes piled on top, I knew it was going to be an unforgettable meal. As busy as it was, the real reason I stopped was because I smelled, then saw their beautiful arrangement of ca kho to, sitting in their clay-pot homes, braised and oily, and ready to be eaten. 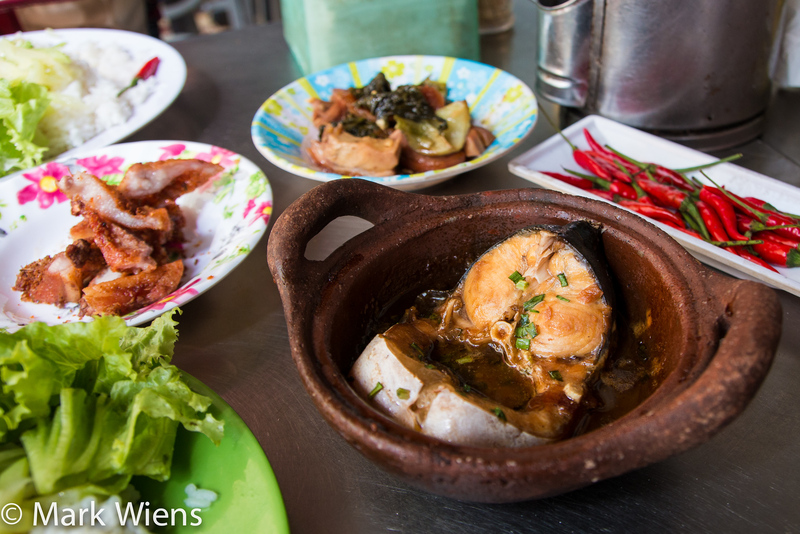 The ca kho to was incredibly delicious, sweet and caramel flavored, and the fish was fatty and meaty. The onions and garlic countered the sweetness, and it was a true harmony of flavors. I ran out of time before I was able to eat at Đông Hoa Xuân, but I really wanted to go, so if you have the time, you could make the trip. I’m hoping to eat at this restaurant on my next visit to Saigon. One night I was just wandering around, I came across Nguyen Thuong Hien street, which at the time I didn’t know was quite famous throughout Saigon as a snail eating street. After walking through the street a number of times, I decided to have dinner at a restaurant known as Ốc A Sòi. 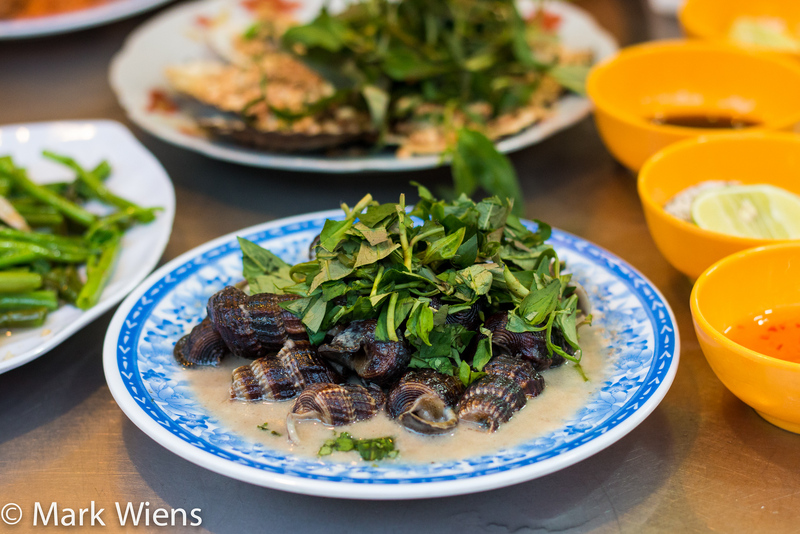 I enjoyed a number of different snail and shell dishes, including mud creeper snails in sweet coconut milk, Babylonia areolata coated in salt and chili, and Ốc tỏi, some kind of giant garlic snails roasted and seasoned with chili jam. There are many amazing places to eat fresh seafood and snails throughout Saigon, but I thought Ốc A Sòi restaurant, though perhaps not the best in the city, was good, the staff were friendly during my number of meals there, and it was relatively easy to order. Ốc Đào – One of the most famous in the city, many of you recommended this place, but I ran out of time before making it here. This restaurant looks amazing. Walking around Saigon I noticed a number of signs for restaurants and street food stalls serving bo kho, but finally when it came time to eat it, I decided to check out a recommendation I got from Eating Saigon. The restaurant had a wonderful friendly feeling to it as soon as I walked there. The restaurant is sort of half inside and half outside along the street, tucked just away from the main road into a quieter neighborhood. At the front of the restaurant was the mega, constantly simmering cauldron of deep red colored beef stew, with a nice layer of oil bubbling on top that looked like magma. My taste buds began to water, and the smell was irresistible to my nostrils. There were two different ways to order their bo kho, along with yellow egg noodles in the bottom, or served with banh mi, the Vietnamese personal sized baguettes. Ying and I decided to get one of each. The stew was ladled into a bowl, dashed with fresh pepper, and sprinkled with a handful of sliced onions, cilantro and green onions, and served with the mandatory condiments of more herbs, and those wonderful spicy Vietnamese chili peppers. The stew was mild in flavor, but truly warm and comforting, slightly tomatoey, with big tender chunks of juicy beef. I also really loved the carrots, which were tender and naturally sweet. For some reason the bowl of bo kho with banh mi included more oil in the stew than the bowl we ordered with egg noodles. So overall I preferred the egg noodles as it was less oily, but both were quite wonderful. 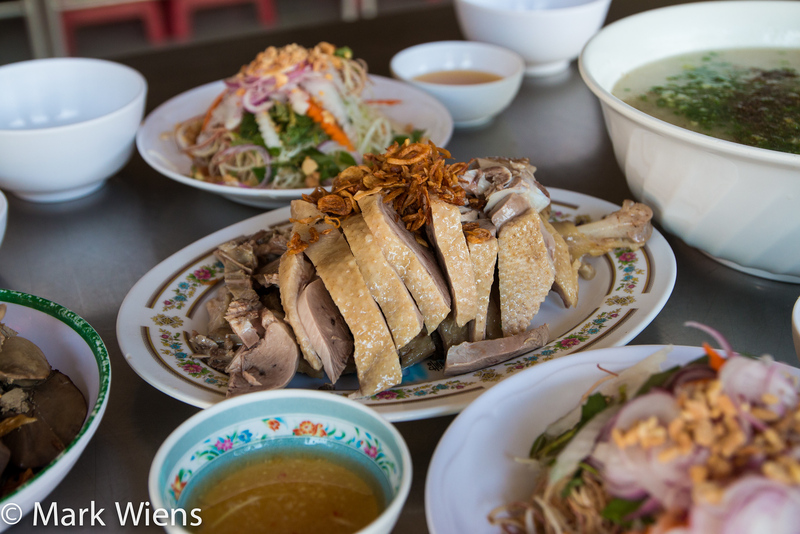 Bo la lot is available throughout Saigon, and is especially common for dinner. One evening I met up with friends Jodi and James, and we headed to a side of the road food stall, somewhere around Tôn Đức Thắng road, where there are a number of bo la lot street food stalls. The food was quite cheap and delicious. While bo la lot is often served for dinner, there is one restaurant in Saigon (probably others too), that serves it throughout the day called Cô Liên Bò Lá Lốt. I had walked past the restaurant on the other side of the road many times, but had never thought anything of the restaurant. But after some online research on Foursquare, I realized Cô Liên served bo la lot and I needed to eat there. As soon as I walked in, the owner of the restaurant and her staff were all extremely kind (just like at so many other Saigon restaurants), and the restaurant wa decorated and painted green too – it really got me in the bo la lot eating mood. 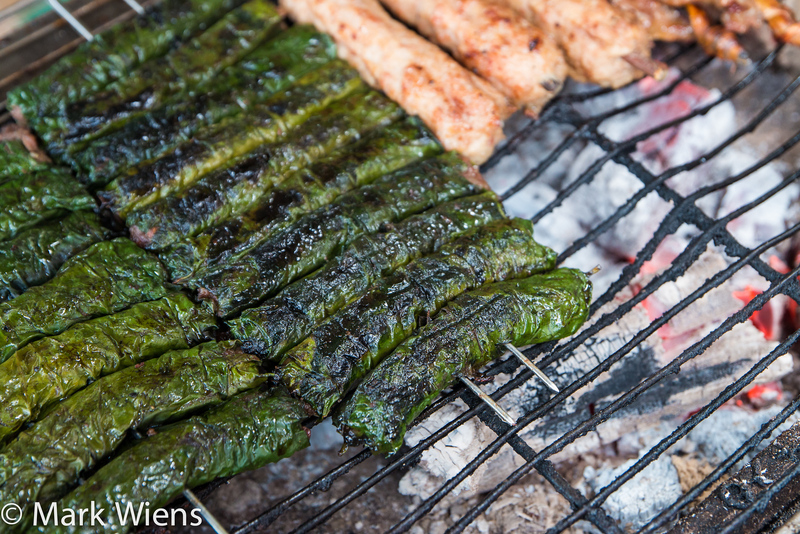 As soon as I ordered, the little pre-wrapped wild betel leaf rolls were transferred to the hot charcoal grill sitting right outside the door, and scorch grilled for a few minutes, giving them a quick char. They were among the best bo lat lot rolls I’ve ever had in my life, the meat was rich and salty, and the leaves were green tasting, herby, and just packed with flavor. The complementing herbs and sauce were also superb. 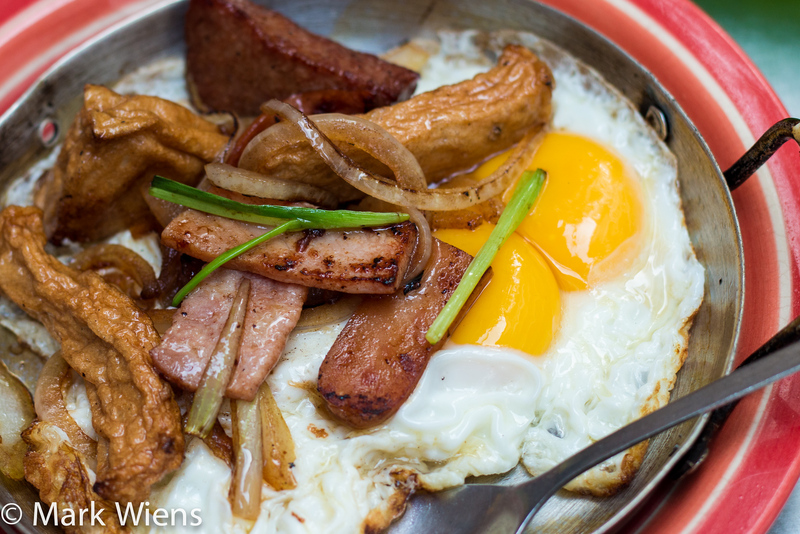 In addition to the bo la lot, we also got a plate of mỡ chài, another type of Vietnamese sausage, without the leaf wrapper, which were also delicious. Though the bo la lot is more expensive at Cô Liên Bò Lá Lốt than at street food stalls, they included much more meat and were bigger in size. 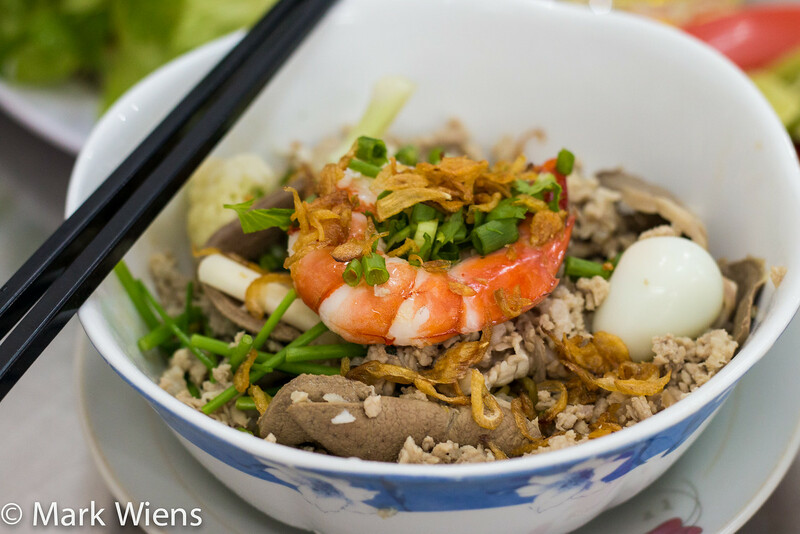 Alright, that’s it for the 25 dishes included on this list, but by all means there are many other Vietnamese foods to try when you’re traveling (or living) in Vietnam.